The Subcommittee on Aquaculture (SCA), previously known as the Interagency Working Group on Aquaculture, serves as the federal interagency coordinating group working to increase the overall effectiveness and productivity of federal aquaculture research, regulation, technology transfer, and assistance programs. The subcommittee includes members from NOAA, USDA, EPA, Army Corps of Engineers, and other federal agencies. The current work plan for the group was approved by the Office of Science and Technology Policy and can be found here. The Science Planning Task Force of the SCA has recently developed a draft outline and is seeking public comment on the document. The draft outline can be downloaded here. Comments on the outline can be submitted through April 19, 2019. Please email your comments to: AquaSciencePlan@usda.gov. 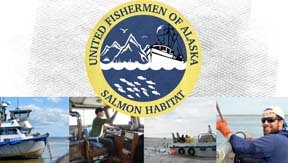 United Fishermen of Alaska is seeking an Office Manager based in Juneau to work in a fast-paced environment. The Office Manager is responsible for general office work including membership correspondence, bookkeeping, filing of paper and electronic records, meeting preparation, and staff support to the Executive Director. The position is based in Juneau, Alaska. For a more detailed job description, please go to UFA’s website: UFA Office Manager Description. April 3, SB 51 – Natl. Res. Water Nomination/Designation was heard. The bill is scheduled to be heard again in Senate Resources on April 8. On Wednesday, April 3, House Finance dropped amendments to the Governor’s budget. There were several amendments to the Fish and Game budget offered by Representative Carpenter cutting ADF&G Southeast Region Fisheries Management travel by 50%, and drastically reducing Region Fisheries Management for Southeast, Central Region, AYK Region, and Westward Region. Carpenter’s amendments failed. Representative Ortiz also submitted amendments asking to increase funding for Southeast Region Fisheries Management to uphold our agreement with the Pacific Salmon Treaty commitment. Representative Ortiz also made amendments to move the Subsistence and Habitat Divisions into their own appropriation to prevent funds from being moved outside the program. All of Representative Ortiz’s amendments passed. Legislative Meetings of interest for this weekend and the week of April 8 – April 12, 2019. Presentation: Mining Industry Taxes by Department of Revenue. Testimony (Invitation Only). SB 51 – Natl. Res. Water Nomination/Designation (Senate Resources) Currently in Senate Resources with a hearing scheduled for April 8. SB 61 – Commercial Fishermen’s Fund: Vessel Owner Claims (Stevens – UFA Supports) Currently in Senate Rules with no scheduled hearings at this time. SB 63 – Fish Tax: Repeal Muni Refunds/Rev. Share (Senate Rules by Request of the Governor- UFA Opposes) Currently in Senate Community and Regional Affairs with no scheduled hearings at this time. SB 90 – Cook Inlet: New Admin Area; Permit Buyback (Micciche) Currently in Senate Resources with no scheduled hearings at this time. SB 99 *NEW* – Personal Use Fishing Priority (Kawasaki- UFA Opposes). Referred to Senate Resources with no scheduled hearings at this time. HB 35 – Conflict of Interest: Board Fisheries/Game (Stutes – UFA Supports) Moved out of committee and referred to House Rules with no scheduled hearings at this time. HB 41 – Shellfish Enhance. Projects; Hatcheries (Ortiz – UFA Supports) Currently in House Finance with hearing scheduled for April 8. HB 65 – Fish Tax: Repeal Muni Refunds/Rev. Share (House Rules by Request of the Governor – UFA Opposes) Currently in House Fisheries with no scheduled hearings at this time. HB 105 – Commercial Fishermen’s Fund: Vessel Owner Claims. (Ortiz- UFA Supports) Moved out of House Fisheries and assigned to House Finance with no scheduled hearings at this time.